The objective of the game is to score more runs (points) than the opposing team. It is a team game played between two teams of eleven players each. It originated in its modern form in England, and is popular mainly in the Commonwealth countries. In the countries of South Asia , including India , Pakistan, Bangladesh and Sri Lanka, cricket is by far the most popular participatory and spectator sport. It is also a major sport in places such as England and Wales, Australia , New Zealand, South Africa, Zimbabwe and the English -speaking Caribbean (called the West Indies). The length of the game (called a match) can last six or more hours a day, for up to five days in Test matches (internationals) the numerous intervals for lunch and tea, and the rich terminology are notable aspects which can confuse those not familiar with the sport. The cricket ball is a hard, solid ball with an interior of cork and a leather case with a slightly raised sewn seam. For men's cricket, the ball must weigh between 5.5 and 5.75 ounces (155.9 and 163.0 g) and measure between 8 13/16 and 9 in (224 and 229 mm) in circumference. Balls used in women's and youth matches are slightly smaller. A new, highly polished ball is used at the start of each innings in a match. A new cricket ball is harder than a worn one, and is preferred by fast bowlers because of the speed and bounce of the ball as it bounces off the pitch. Older balls tend to spin more as the roughness grips the pitch more when the ball bounces, so spin bowlers prefer to use a worn ball. A captain may delay the request for a new ball if he prefers to have his spin bowlers operating, but usually asks for the new ball soon after it becomes available. This specialised bat is shaped something like a paddle with a flat side and shallow V shaped side, the flat side is used to hit the ball . The bat is traditionally made from willow wood , specifically from the Cricket-bat Willow ( Salix alba var. caerulea ), treated with linseed oil . This wood is used as it is very tough and shock-resistant, not being significantly dented nor splintering on the impact of a cricket ball at high speed, while also being light in weight. It incorporates a wooden spring design where the handle meets the blade. The rules of the game limit the allowable size for a bat as not more than 38 in (965 mm) long and the blade may not be more than 4.25 in (108 mm) wide. Bats typically weigh from 2 lb 8 oz to 3 lb (1.1 to 1.4 kg) though there is no standard. The handle is usually covered with a rubber or cloth sleeve to enhance grip and the face of the bat may have a protective film. The stumps are three vertical posts supporting the bails to form a wicket at each end of the pitch. The stumps are 28 inches tall and usually made of wood. They have a spike at one end for hammering into the ground, and the other end is domed with groove to provide a resting place for the bails. Off stump is the stump on the off side of the wicket. Middle stump is the stump in the middle of the wicket. Leg stump is the stump on the leg side of the wicket. 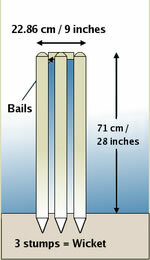 A bail is one of the two smaller sticks placed on top of the three stumps to form a wicket. The bails are used to determine when the wicket is broken. A match is divided into innings , during which one team bats while the other team bowls and fields . In each innings, the bowling team tries to limit the runs scored by the batting team and to get the opposition players out, an event which is described as 'taking a wicket'. The batting team keeps two batsmen on the field. Each player bats until he is out, and then is replaced and does not bat again in that innings. Once ten of the eleven players of the batting team have been dismissed (i.e., ten wickets have been taken) the team is said to be 'All Out' and their innings comes to an end. A team's innings may also be declared closed by the batting team's captain. Matches may be played over one or two innings – that is, one or two turns at bat for each team, so that a "two innings match" contains four innings in total. For most one innings matches such as one-day matches, each team's innings is limited to a set number of overs. An over is a set of six legal (fair) deliveries or balls . This type of match is often called limited-overs cricket. The batting team reaches their target. They are said to have won the match by n wicket(s) , where n is the number of additional wickets the opposing team needed to take to bring the innings to an end. The batting team is dismissed before they can reach their target. They are said to have lost the match by n run(s) , where n is the difference in scores between the teams. In two innings matches, the allotted time for the match expires without the batting team either reaching their target or being dismissed. In this case the result is a draw . A team that sets an enormous target but takes a long time over it risks drawing the match by leaving themselves insufficient time to dismiss the other team, which is the reason a captain will often declare his team's innings closed. In limited-overs (usually one innings) matches, the second team to bat exceeds the score of the first team before the allotted number of overs are up. In this case, the second team batting wins. Also in limited-overs matches, the maximum number of overs available for the second team to bat are used up. In this case, provided the number of runs made by the first team are not exceeded or equalled on the last ball, the second team batting loses. The laws of cricket are a set of rules framed by the Marylebone Cricket Club which serve to standardise the format of cricket matches across the world to ensure uniformity and fairness. The Laws are intended to apply to all two innings matches; the International Cricket Council has implemented "Standard Playing Conditions for Test Matches" and "Standard Playing Conditions for One Day Internationals" to augment the Laws of Cricket. Similarly, each cricketing country has implemented Playing Conditions to govern domestic cricket. Note that the Laws do not provide for One Day or Limited Overs cricket; these modifications have been made by the Playing Conditions for One Day Internationals. The first four laws cover the players, the umpires and the scorers. Law 1: The players . A cricket team consists of eleven players, including a captain. Law 2: Substitutes . In cricket, a substitute may be brought on for an injured fielder. However, a substitute may not bat, bowl or keep wicket. The original player may return if he has recovered. A batsman who becomes unable to run may have a runner, who completes the runs while the batsman continues batting. Alternatively, a batsman may retire hurt, and may return later to resume his innings if he recovers. Law 3: The umpires . There are two umpires, who apply the Laws, make all necessary decisions, and relay the decisions to the scorers. After dealing with the players, the laws move on to discuss equipment and pitch specifications, except for specifications about the wicket-keeper's gloves, which are dealt with in Law 40. These laws are supplemented by Appendices A and B (see below). Law 5: The ball . 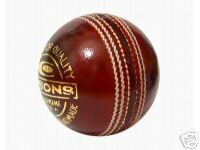 A cricket ball is between 22.4cm and 29cm in circumference, and weighs between 155.9g and 163g. Only one ball is used at a time, unless it is lost, when it is replaced with a ball of similar wear. It is also replaced at the start of each innings, and may, at the request of the fielding side, be replaced after a certain number of balls have been bowled (480 in Test matches). The gradual degradation of the ball through the innings is an important aspect of the game. Law 6: The bat . The bat is no more than than 38 inches (96.5cm) in length, and no more than 4.25 inches (10.8cm) wide. The hand or glove holding the bat is considered part of the bat. The blade of the bat must be made of wood (and in practice, they are made from the white willow tree ). Law 7: The pitch . The pitch is a rectangular area of the ground 22 yards (20.12m) long and 10ft (3.05m) wide. The Ground Authority has selects and prepares the pitch, but once the game has started, the umpires control what happens to the pitch. The umpires are also the arbiters of whether the pitch is fit for play, and if they deem it unfit, with the consent of both captains can change the pitch. Professional cricket is almost always played on a grass surface. However, if a non-turf pitch is used, the artificial surface must have a minimum length of 58ft (17.68m) and a minimum width of 6ft (1.83m). Law 8: The wickets. The wicket consists of three wooden stumps that are 28 inches (71.1cm) tall. The stumps are placed along the batting crease with equal distances between each stump. They are positioned so they are 9 inches (22.86cm) wide. Two wooden bails are placed on top of the stumps. The bails must not project more than 0.5 inches (1.27cm) above the stumps, and must, for men's cricket, be 4.3125 inches (10.95cm) long. There are also specified lengths for the barrel and spigots of the bail. There are different specifications for the wickets and bails for junior cricket. The umpires may dispense with the bails if conditions are unfit (ie it is windy so they might fall off by themselves). Further details on the specifications of the wickets are contained in Appendix A to the laws. Law 9: The creases. The crease is the area demarcated by white lines painted or chalked on the field of play. There are four creases (one popping crease, one bowling crease, and two return creases) are drawn at each end of the pitch, around the two sets of stumps. The batsmen generally play in and run between the areas defined by the creases at each end of the pitch. Law 10: Preparation and maintenance of the playing area. During the match the pitch may be rolled at the request of the captain of the batting side, for a period of not more than 7 minutes, before the start of each innings, other than the first innings of the match, and before the start of each subsequent day's play. In addition, if, after the toss and before the first innings of the match, the start is delayed, the captain of the batting side may request to have the pitch rolled for not more than 7 minutes, unless the umpires together agree that the delay has had no significant effect on the state of the pitch. Once the game has begun, rolling may not take place other than under these circumstances. If there is more than one roller available the captain of the batting side shall have the choice. There are detailed rules to make sure that rolling, where possible, is conducted so as not to delay the game, but, if necessary, the game is delayed to allow the batting captain to have up to 7 minutes rolling if he so wishes. Before a pitch is rolled it is first swept to avoid any possible damage by rolling in debris. The pitch is also cleared of any debris at all intervals for meals, between innings and at the beginning of each day. The only exception to this is that the umpires do not allow sweeping to take place where they consider it may be detrimental to the surface of the pitch. Both the pitch and the outfield is mown on each day of a match on which play is expected to take place, if ground and weather conditions allow. Once a game has begun mowings are carried out under the supervision of the umpires. The umpires are required to make sure that bowlers' and batsmen's footholes are cleaned out and dried whenever necessary to facilitate play. In matches of more than one day's duration, if necessary, the footholes made by the bowler in his delivery stride may be returfed or covered with quick-setting fillings to make them safe and secure. Players may also secure their footholds using sawdust provided that the pitch is not damaged or they do not do so in a way that is unfair to the other team. Law 10 also provides that the pitch is not watered during the match and that the creases are re-marked whenever either umpire considers it necessary. Law 11: Covering the pitch. Law 11 provides that during the match the pitch shall not be completely covered unless provided otherwise by regulations or by agreement before the toss. When possible, the bowlers' run ups are covered in inclement weather to keep them dry. If the pitch is covered overnight, the covers are removed in the morning at the earliest possible moment on each day that play is expected to take place. If covers are used during the day as protection from inclement weather, or if inclement weather delays the removal of overnight covers, they are removed as soon as conditions allow. Laws 12 to 17 outline the structure of the game. Law 12: Innings - An innings or inning is a segment of the game during which one side takes its turn to bat. In cricket, the term innings is both singular and plural and is always spelled and pronounced with the terminal "s". An individual innings usually lasts until the batsman is given out, or until the end of the team innings. Although batsmen bat together in pairs, this combination is never called an innings : it is a partnership or a stand . Law 13: The follow-on - Follow-on is a term (noun and verb) it describes the situation where a team has two consecutive innings . Cricket matches are played over either one or two innings. The 'follow-on' is only used in games played over two innings. In these games the teams take turns in batting. Team A has its first innings followed by Team B. Then Team A has its second innings, and unless Team B has already scored more runs than Team A, Team B has its second innings. However, if Team B scores substantially fewer runs than Team A in its first innings, Team A's captain may force Team B to bat again (to 'follow-on') straight away, so that the order of the innings is: A, B, B, and, if necessary, A again. In its second innings, Team B is then said to be 'following-on'. The captain of the batting side may declare an innings closed, when the ball is dead , at any time during a match. Usually this is because the captain thinks his team has already scored enough runs to win the match, though tactical declarations are sometimes used in other circumstances. Law 15: Intervals - Games are played over a number of hours or days, making it one of the sports with the longest playing time. Typically, games of first-class cricket are played over three to five days with at least six hours of cricket being played each day. One-day cricket matches last for six hours or more. Cricket therefore has special rules about intervals for lunch, tea and drinks as well as rules about when play starts and ends. Law 16: Start of play; cessation of play - A game starts when the umpire at the bowler's end calls ‘Play'. ‘Play' is also called to restart the game after an interval or interruption. Before an interval in or interruption of play, and at the end of a match, the umpire at the bowler's end calls ‘Time' and removes the bails from both of the wickets . The bowling side cannot make an appeal for a dismissal after ‘Time' has been called. If the players leave the field, either for adverse conditions of ground, weather or light, or in exceptional circumstances, and no further play is possible. Law 17: Practice on the field - Players are not allowed to practise bowling or batting on the pitch, or on the area parallel and immediately adjacent to the pitch, at any time on any day of the match. Practice on a day of a match on any other part of the cricket square is only permitted before the start of play or after the close of play on that day, but must cease 30 minutes before the scheduled start of play or if it is detrimental to the surface of the square. The laws then move on to discuss how runs can be scored and how one team can beat the other. Law 18: Scoring runs . Runs are scored when the two batsmen run to each other's end of the pitch. Several runs can be scored from one ball. Law 19: Boundaries . A boundary is marked round the edge of the field of play. If the ball is hit past this boundary, four runs are scored, or six runs if the ball didn't hit the ground before crossing the boundary. Law 20: Lost ball . If a ball in play is lost or cannot be recovered, the fielding side can call "lost ball". The batting side keeps any penalty runs (such as no-balls and wides) and scores the higher of six runs and the number of runs actually ran. Law 21: The result . The side which scores the most runs wins the match. If both sides score the same number of runs, the match is tied. However, the match may run out of time before the innings have all been completed. In this case, the match is drawn. Law 22: The over . An over consists of six balls bowled, excluding wides and no balls. Consecutive overs are delivered from opposite ends of the pitch. A bowler may not bowl two consecutive overs. Law 23: Dead ball . The ball comes into play when the bowler begins his run up, and becomes dead when all the action from that ball is over. While the ball is dead, no runs can be scored and no batsmen can be dismissed. The ball also becomes dead when a batsman is dismissed, which prevents baseball-style double plays . Law 24: No ball . A ball can be a no ball for several reasons: if the bowler bowls from the wrong place; or if he straightens his elbow during the delivery; or if the bowling is dangerous; or if the ball bounces twice or rolls along the ground before reaching the batsman; or if the fielders are standing in illegal places. A no ball adds one run to the batting team's score, in addition to any other runs which are scored off it, and the batsman can't be dismissed off a no ball except by being run out, or by handling the ball, hitting the ball twice, or obstructing the field. Law 25: Wide ball . A ball is a wide if the batsman can't hit it from the normal standing position or from where he is actually standing. A wide adds one run to the batting team's score, in addition to any other runs which are scored off it, and the batsman can't be dismissed off a wide except by being run out or stumped, or by handling the ball, hitting the ball twice, or obstructing the field. Law 26: Bye and leg bye . If a ball that isn't a no ball or wide passes the striker and runs are scored, they are called byes. If a ball that isn't a no ball hits the striker but not the bat and runs are scored, they are called leg-byes. However, leg-byes cannot be scored if the striker is neither attempting a stroke nor trying to avoid being hit. Byes and leg-byes are credited to the team's but not the batsman's total. Laws 27 to 29 discuss the main mechanics of how a batsman may be dismissed. Law 27: Appeals . If the fielders believe a batsman is out, they may ask the umpire "How's That?" (or more commonly, something like "Howzaaaat?") before the next ball is bowled. The umpire then decides whether the batsman is out. Law 28: The wicket is down . Several methods of being out occur when the wicket is put down. This means that the wicket is hit by the ball, or the batsman, or the hand in which a fielder is holding the ball, and at least one bail is removed. Law 29: Batsman out of his ground . The batsmen can be run out or stumped if they are out of their ground. A batsman is in his ground if any part of him or his bat is on the ground behind the popping crease. If both batsman are in the middle of the pitch when a wicket is put down, the batsman closer to that end is out. Laws 30 to 39 discuss the various ways a batsman may be dismissed. In addition to these 10 methods, a batsman may retire out. That provision is in Law 2. Law 30: Bowled . A batsman is out if his wicket is put down by a ball delivered by the bowler. It is irrelevant as to whether the ball has touched the bat, glove, or any part of the batsman before going on to put down the wicket, though it may not touch another player or an umpire before doing so. Law 31: Timed out . An incoming batsman must be ready to face a ball (or be at the crease with his partner ready to face a ball) within 3 minutes of the outgoing batsman being dismissed, otherwise the incoming batsman will be out. Law 32: Caught . If a ball hits the bat or the hand holding the bat and is then caught by the opposition within the field of play before the ball bounces, then the batsman is out. Law 33: Handled the ball . If a batsman handles the ball with a hand that is not touching the bat without the consent of the opposition, he is out. Law 34: Hit the ball twice . If a batsman hits the ball twice other than for the purposes of protecting his wicket or with the consent of the opposition, or if he attempts a run after hitting the ball twice to protect his wicket, he is out. Law 35: Hit wicket . If, after the bowler has entered his delivery stride and while the ball is in play, a batsman puts his wicket down by his bat or his person. The striker is also out hit wicket if he puts his wicket down by his bat or his person in setting off for a first run. "Person" includes the clothes and equipment of the batsman. Law 36: Leg before wicket (LBW). If the ball hits the batsman without first hitting the bat, but would have hit the wicket if the batsman was not there, and the ball does not pitch on the leg side of the wicket the batsman will be out. However, if the ball strikes the batsman outside the line of the off-stump, and the batsman was attempting to play a stroke, he is not out. Law 37: Obstructing the field . If a batsman wilfully obstructs the opposite by word or action, he is out. Law 38: Run out . A batsman is out if at any time while the ball is in play no part of his bat or person is grounded behind the popping crease and his wicket is fairly put down by the opposing side. Law 39: Stumped . A batsman is out when the wicket-keeper (see Law 40) puts down the wicket, while the batsman is out of his ground and not attempting a run. Law 40: The wicket-keeper - The wicket-keeper in cricket is the fielding player who stands behind the batsman on strike at the wicket . Law 41: The fielder - A fielder collects the ball when it is struck by the batsman in such a way as to either limit the number of runs that the batsman scores or get the batsman out by catching the ball or running the batsman out. A fielder may field the ball with any part of his person. However, if, while the ball is in play he wilfully fields it otherwise, the ball becomes dead and 5 penalty runs are awarded to the batting side unless the ball previously struck a batsman not attempting to hit or avoid the ball. Law 42: Fair and unfair play - This law has developed and expanded over time as various incidents of real life unfair play have been legislated against. The first section of law 42 makes clear that the captains of the two teams have the responsibility for ensuring that play is conducted within the spirit and traditions of the game as well as within the Laws. This leads on to a statement that the umpires are the sole judges of fair and unfair play. It contains an override of the laws of cricket: of either umpire considers an action that is not covered by the laws to be unfair, he intervenes and will call the ball dead if the ball is in play. The state of the ball has a big effect on how difficult a delivery is for a batsman. A cricket ball is not symmetrical. It is in two parts stitched together to form a seam. How a ball swings, seams, and spins depends in part on how much air resistance there is to different parts of the ball, and to what degree the ball has deteriorated. A cricket team will normally seek to shine one side of the ball and rough up the other side. The resultant variation in air resistance on the two halves of the ball can then have a marked effect. Ball tampering has always been a feature of the sport. Players will use objects to rough up one side of the ball, and use resins and Brylcreem to shine the other. This sort of ball tampering is against the spirit of the game and has always been against the rules. Though, as it can be difficult to spot, it has always gone on with limited sanction. The television age has meant that from the 1990s onwards most international games have been televised. Slow motion replays have highlighted a number of incidents of ball tampering: some of which have been widely reported in the press. The third section of law 42 contains the rules and sanctions against ball tampering and requires the umpires to make frequent and irregular inspections of the ball to counter it. It also contains punitive measures against fielders who do tamper with the ball. Some acts that may alter the ball are permitted. A fielder may polish the ball as long as no artificial substance is used, remove mud from the ball under the supervision of the umpire and dry a wet ball on a towel. But no-one may rub the ball on the ground for any reason, interfere with any of the seams or the surface of the ball, use any implement, or take any other action whatsoever which is likely to alter the condition of the ball. If a fielder illegally changes the condition of the ball, the umpires replace the ball with another one with similar wear to the old ball before the ball tampering. The umpires also award five runs to the batting team and report the incident to the relevant authorities that the fielder is responsible to. These authorities are then expected to take further disciplinary action against the player as appropriate. If there is a further incidence of ball tampering in the innings, the same procedure is followed, but the bowler of the immediately preceding ball is banned from bowling further in that innings too. If a member of the fielding side deliberately distracts or attempts to distract the batsman on strike while he is preparing to receive or receiving a delivery, the umpire immediately declares the ball to be dead. The umpire also informs the fielding captain of the incident. The batsman may not be dismissed from the delivery, which must be repeated. If this happens again in the innings the same procedure is followed, but the batting team is awarded five penalty runs too. It is also unfair for a member of the fielding side to deliberately attempt to distract or obstruct either batsman after the striker has received the ball by word or action. If this happens a procedure similar to the procedure for the first instance of ball tampering occurs, although the batting side also scores any runs that they have scored before the attempted (or actual) distraction or obstruction. The bowling of fast short pitched balls and of high full pitched balls is dangerous and is also considered unfair. Where the umpire considers that there are regular fast short pitched balls, that by their length, height and direction, coupled with the relative skill of the batsman is dangerous, the umpire calls no ball and cautions the bowler. If this happens a third time in an innings, the bowler is barred from bowling again in that innings, and is reported to the authorities he is responsible to for further disciplinary action. Where a delivery, after pitching passes over the head of the striker, the umpire calls no ball and includes it in his consideration of whether fast short pitched bowling is unfair, even though such a delivery is not dangerous. High full pitched balls that pass or would have passed on the full above waist height of the striker are deemed dangerous unfair, except for slow deliveries, where the rule is above shoulder height. The same sanctions apply to high full pitched balls as apply to fast short pitched balls. Such deliveries, which are called beamers , can be incredibly dangerous. Usually they only occur by mistake, when a ball slips in the bowler's hand at the point of delivery and bowlers usually immediately apologise to the batsman for their mistake. If they are bowled deliberately, no ball is immediately called, the bowler is removed and is reported to the authority to which he is responsible for further disciplinary action. Time wasting can be used as a deliberate tactic to win a game. If rain is forecast, a side that is in a losing position can play slow, with the hope that rain will save them and turn the result into a draw rather than a defeat. Time wasting can also be used tactically elsewhere in the game: for instance, to minimise the number of deliveries between a given time and an interval . Law 42 includes rules to counter unfair time wasting. If the fielding side wastes time, or progresses an over unnecessarily slowly, it is first warned by the umpire. Any further occurrence, there is a further sanction. If the further occurrence happens otherwise than during an over, the batting side is awarded 5 penalty runs. If the further occurrence happens during an over, the bowler is banned from bowling further in the innings. In both instances the relevant Governing Body is informed so it may consider further disciplinary action. In normal circumstances the striker should always be ready to take strike when the bowler is ready to start his run up. If he wastes time, in the first instance the batsman is warned by the umpire. That warning applies to the batting team as a whole and each incoming batsman is informed of that warning. If there is further time wasting by any batsman in that innings, the umpires award the fielding side 5 runs and inform the Governing Body so it may consider further disciplinary action.